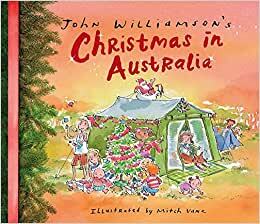 From Australian icon and singer-songwriter, John Williamson, comes this hugely popular family song, brought to life by talented artist, Mitch Vane. John Williamson is, without question, an Australian Icon. His entertainment career spans more than fifty years, boasting sales of over 5 million albums. His unofficial anthems, funny and tender ballads and tributes to unsung heroes have captured the spirit of the nation in song more than any other performer. He remains one of the most in-demand live performers in Australia. His fiftieth album, Honest People, was released in 2104 at the same time as his autobiography, and in 2018 he released his fifty-first, Butcherbird. Two songs from his popular JW's Family Album have been made into delightful, entertaining picture books for children. Mitch Vane has had a long career working as an illustrator and artist. She is interested in all forms of visual story-telling using a variety of mediums but is at her happiest drawing with a good old-fashioned dip pen and Indian ink. Mitch often collaborates with her partner Danny Katz - her cartoons appeared with his weekly humour column in The Age - and they have created many children's books together, including Aussie Bites - The Parents are Revolting and Big Bad Bunnies. Mitch illustrated a series of 12 Zodiac themed stamps for Australia Post and has created many children's books with publishers both in Australia and the U.S.
She works from her studio at home in Melbourne, and does illustration workshops and appearances at libraries and schools throughout the year.